Delta KIT by TVL & RevenantA N E W W A Y T O S Q..
Delta Mod by TVL & RevenantA N E W W A Y T O S Q..
TVL Snubnose Shotgun Based on the TVL Colt 45 frame, the TVL Snubnose Shotgun is a new and inno..
TVL Silencer ModThe Silencer is a hard hitting mod in the TVL tradition.Features:full mechanical mod..
TVL Scope Shotgun The TVL Scope Shotgun is a hybrid dual 18650 mechanical mod.Features:Full Mec..
TVL Rifle Ring Shotgun The TVL Rifle Ring Shotgun is a dual 18650 single tube Mechanical Mod. B..
TVL Rifle Ring ModBased on our hard hitting Colt .45 Frame, the TVL Rifle Ring hits like a Freight T..
TVL Colt 45 Shotgun The TVL Colt 45 Shotgun is a dual 18650 single tube Mechanical Mod. 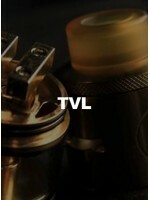 The top..
TVL 9 Ring Magnum MODThe new 9 Ring Magnum Mod by TVL is a single 18650 hybrid mechanical mod with a..
TVL 5 Ring Magnum MODThe new 5 Ring Magnum Mod by TVL is a single 18650 hybrid mechanical mod with a..
TVL 3 Post RDAThe TVL Three Post RDA is made from 100% oxygen free navel brass and 99.99% pure trill..
TVL 2/3 ModThe TVL 2/3 Mod is a hybrid single 18650 mechanical mod. The top deck is 24.8mm and the b..
TVL 2 Post RDAThe TVL Two Post RDA is made from 100% oxygen free navel brass and 99.99% pure trilliu..